We spent 7 days researching and testing 15 different types of memory foam pillows and found that density, longevity, and support level were most important. The Sleep Innovations Cool Contour Memory Foam Pillow scored high above the others tested in all categories and is our top pick. The 2 layer design of this pillow provides a cool foam layer that stayed cool all night long. No pillow flipping needed with this pillow. It offers high and low sections for different sleeping needs and the ergonomic design is perfect for ensuring proper spinal alignment. There will be no tossing and turning when sleeping on this pillow. When it comes to the benefits of a good night’s sleep, nothing can quite compare. 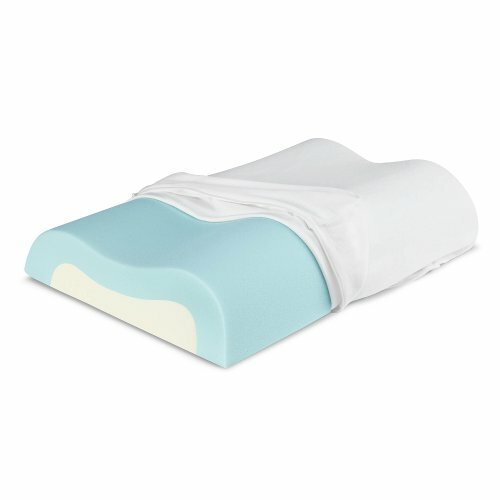 If you’ve been having some difficulty lately, waking with neck or shoulder pain, feeling like you’re constantly fluffing and moving the pillow, or simply experiencing poor alignment in your sleep, then a memory foam pillow is an amazing way to improve your sleeping, comfort, and overall health. The quality of our sleep is a highly important factor in our wellbeing, and that’s why using the power of memory foam can seriously enhance your life. View this review if you need to find a good pillow cover and sheet sets for your memory foam pillow. To begin, it can seem quite daunting when you’re on the market for a memory foam pillow. There are so many of them out there, and most of them aren’t all that cheap. That’s why it’s important to start by examining the best of the best. We’ll explore the top rated memory foam pillows, and discuss how these gems can seriously improve how you sleep at night. You’re going to experience such great results that you might start to purchase them as gifts for all your family members. Since a well-rested person is a good natured person, you may be tempted to buy one for your boss or even accountant. Everyone is happier when they sleep on a memory foam pillow, but the person who really deserves the benefits is you. Finding the right pillow for you is all about knowing yourself. You want to understand how it is that you sleep, what your particular concerns are, and what kind of firmness you like. Memory foam is designed to work with the unique contours of your body, so no matter what memory foam pillow you buy you can be sure that it’s going to work with you every moment of the night. So lets begin on your journey towards a more customized, comfortable sleeping experience. Are you looking for the benefits of a contour pillow? Well this product from Sleep Innovations takes the contour pillow to a whole new level. The 2-layer pillow is designed to provide all the therapeutic benefits you get from a standard contour design, but also with additional benefits and enhanced functionality. The feel of this pillow is medium to medium-firm, and it’s ideal for those who sleep on their side or back. The 2 layer design provides a cool foam comfort layer that stays cool all throughout the night, and the high and low loft is designed for all sleeping profiles. Feel the difference of sustained support and comfort all throughout the night, with no need to make adjustments. The ergonomic shape enhances proper spinal alignment and gives you the support you need for the best sleep of your life. Customers consistently praise this pillow because it gently hugs your shoulders and neck while you sleep, giving you the support that helps you to sleep more soundly. Did you know that excess heat can cause sleep disturbances? Well, this pillow will eliminate the pesky heat and keep your head at the ideal temperature all night long. Not only that, but memory foam is just downright cozy. This pillow eliminates the need to adjust or puff-up the pillow during the night to achieve the right firmness. The shape and density of the pillow is maintained no matter how many times you use it. Sleep Innovations is known for using the best Cool Flow memory foam that you can find on the market. Underneath the cool top layer you get the SureTemp memory foam core. This is a unique, patented formulation that is designed to stay firm, and stay cool. The foam is also manufactured to be ultra durable. With the high loft and low loft, you can find the perfect sleeping position for you, and the pillow will accommodate that position. All in all, this pillow will eliminate tossing and turning throughout the night, and help you to achieve the best sleep of your life. Perfect for everyone in the family, the pillow will accommodate all body types, ages, sizes, and sleeping styles. The Conforma pillow from Classic Brands is a top rated memory foam pillow that responds to temperature and pressure and effortlessly molds to the shape of your head and neck, creating the ideal amount of support all throughout the night. If you’re an allergy sufferer, then your’e going to love this memory foam pillow because it is naturally hypo-allergenic. Ideal for side and back sleepers, the Conforma features velour knit fibers that are designed to work with the memory foam material to optimize the contouring properties. There is also tailored knit fabric which is designed to promote proper airflow for a cool, comfortable night’s sleep. The open cell structure of the memory foam in the Conforma is designed to provide superior pressure relief and increased airflow. Due to this ventilation, you’re going to enjoy the cooling properties of this pillow, which naturally dissipate heat and create a more comfortable sleeping environment. Classic Brands boasts of using the next generation of memory foam which is more porous and open than conventional foam. What this means for you is that you can enjoy a more breathable and comfortable high density pillow. Customers consistently praise this pillow because of the sleep benefits that it provides, but it’s also backed by a 3 year accessory warranty, and that protects you against any manufacturer’s defects. This warranty is considered to be one of the best in the industry, and it comes from the company’s firm belief in the integrity and benefits of their pillow. If you’re on the market for a top rated memory foam pillow, then choosing the Conforma is definitely a smart idea. It’s top rated because it consistently delivers wonderful results that customers can feel all throughout the night, and it comes at a reasonable price. There’s nothing more therapeutic than sleeping in a healthy position, and this contour pillow from Sleep Innovations is designed to gently cradle your head and neck so you can achieve perfect sleep. Sleep Innovations is one of the most trusted names when it comes to contour pillows, and this model is one of their best. The orthopedic design promotes proper spinal alignment all throughout the night, which can provide relief for those who suffer from snoring, insomnia, or stress. The pillow is designed for personalized comfort, so no matter what size, age, or shape you are, you can enjoy the benefits of using this pillow. The pillow allows tired muscles to relax and rejuvenate while you sleep, for a fresher, brighter morning. Using premium 3-pound memory foam, the pillow evenly distributes body weight for better circulation that soothes all your sensitive pressure points. The soft terry velour cover isultra comfortable and can easily be removed for effortless cleaning. The pillow is completely hypoallergenic and made right in the USA. You’re going to enjoy the medium to medium-firm feel of this pillow, and it’s ideal for those who sleep on their side or back. There is a high and low loft on the pillow, so that you can find comfort no matter what your sleeping profile might be. Also, thanks to the SureTemp memory foam layer, you’re guaranteed to stay cool all throughout the night. It’s no wonder why Sleep Innovations is one of the top rated brands of memory foam pillow. They back this product by a 5 year limited warranty, and it’s easily machine washable. Perfectly designed to relieve neck and shoulder pain, you’re going to feel more relaxed and comforted throughout the night. Intuitively responding to your body weight, the pillow will provide support exactly where you need it for fewer aches and pains during the day. The ergonomic shape works great with any body type, so you’re guaranteed a customized experience. If you’re looking for the perfect pillow for you, then you’re going to absolutely love the benefits that this contour pillow provides. The above products are three of the top rated memory foam pillows on the market. These are the tried and true choices which customers consistently praise for their performance, benefits, price, and dependability. These products are a great place to start when you’re on the lookout for the perfect memory foam pillow for you or someone you love. If you still want to search, then the buyer’s guide below will help to guide you on your search. Purchasing a memory foam pillow can seem daunting because there are so many choices out there, and that’s why when you arm yourself with knowledge you’ll be better able to make a sound decision. There are key questions that you should ask yourself before your purchase, and one of the most important things to know is why you need one in the first place. Clarify what your goals are, and how you want to improve and enhance your sleeping experience. Memory foam pillows use state of the art technology, and that’s why they cost much more than standard pillows. Be prepared to invest in a product that can seriously improve the quality of your life. So, lets learn a bit more about memory foam pillows, how they’re designed, and what benefits they impart. The product has a unique and interesting history, and you’re going to be amazed at the results that you can experience after just one night’s use. Whether you’re purchasing for you or someone you love, you’re going to be a true believer once you switch to a more enhanced sleeping situation. If you’re looking for more comfort and luxury in bed, as well as better health, then it’s a smart choice to purchase a memory foam pillow. Any pillow with a good density and velocity will add extra support to your head and neck to enhance the quality of your sleep. There are so many memory foam pillows on the market, and the technology seems to get better each and every day. Aside from purchasing a great mattress, purchasing a memory foam pillow is the smartest thing you can do to enhance the hours you spend in bed. Did you know that we spend at least a third of our lives in bed? It’s important to not take your comfort for granted when it comes to stepping into bed at night. This guide is designed to show you how to purchase the perfect memory foam pillow for you. There are many reasons why you should purchase a memory foam pillow, either for yourself or someone you love. The quality and luxury that it adds to your life can not be underestimated. But, the best reason to buy one of these pillows is the technology involved. They’re designed to change shape in response to your own body heat, and that means the pillow will soften and take the shape of your head for the ultimate in comfort and support. If you or someone you know suffers from neck pain, the pillow will help to keep your neck stable and in place all night long, allowing the muscles to relax. How Will It Be Used? : You want to purchase a memory foam pillow based upon your needs. Because they are more expensive than a standard pillow, it’s important to understand what your personal concerns and struggles are when it comes to sleeping. When you know exactly what you want to achieve by using the pillow, you’ll be better able to find a pillow that suits those needs. If you’re purchasing for a family member, be sure to completely understand what problems they’re having and how a memory foam pillow might be able to help. What Are You Willing to Spend? : Memory foam pillows differ greatly in price, and there are a number of factors that go into their price tags, such as size, materials, and density. If it’s your first time purchasing a memory foam pillow then you’ll want to perhaps not break the bank the first time around. Decide what your budget is going to be and then find a memory foam pillow that fits into your budget while still providing all the features that you crave. Size: You’re going to want to purchase a memory foam pillow that suits the size of your mattress. Take for instance, if you have a king size bed, then you’ll want to purchase extra large pillows to fit. The standard size pillows will fit any queen size or double bed. For some people, the king size pillow will seem a little too big and they’ll opt for the standard size instead. Be sure to see the sizes in person so you can get a sense of what is going to work for your body. Do keep in mind that pillow cases are sold separately. What’s Your Sleep Position? : Knowing what position you sleep in will help you to narrow down your search for a memory foam pillow. There will be a slight pillow variation for those who sleep in different positions. For instance, if you sleep on your back your pillow should be designed to enhance the comfort of your spine while you’re lying in this position. This will most likely be a thinner pillow to keep you in the proper alignment. If you sleep on your side then you may want to favor a thicker pillow that supports the head and neck. Similar to back sleepers, stomach sleepers should favor a thinner pillow to keep their spine in a good position. Pillow Firmness: There are a number of different sizes and shapes when it comes to a memory foam pillow, but there are also a number of different densities to choose from. It is commonly thought that a denser pillow is more comfortable and supportive to the neck and head, but you’ll need to do a bit of experimentation to decide for yourself. Memory foam pillows tend to be quite soft and comfy, so decide for yourself the level of firmness that is right for you. Pillow Covers: Sometimes you’ll need to purchase a pillow cover separately, and what material you choose will depend upon your personal preferences. What is usually offered is either a terry or velour cover that can be unzipped. Whether you want to purchase a separate cover is up to you, but usually the memory foam pillow works best without any extra cover. Some choose to add a pillow cover to prevent staining of the pillow. Some also want to add an extra cover so that the memory foam pillow fits in with the overall bedding decor. Whatever you choose, be sure to find something that is very easy to clean. Purchase From a Licensed Seller: There are so many memory foam pillows on the market, and like with anything, there are knock-offs. 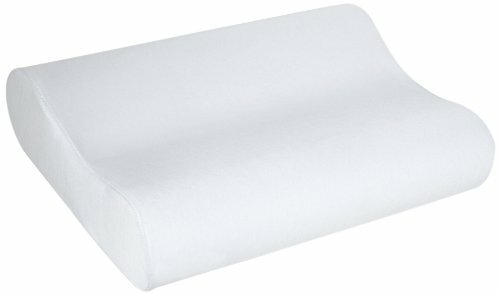 You want to be sure to purchase your pillow from a reputable, licensed seller. This will ensure that you get a good quality pillow without any threat of purchasing a counterfeit. Contour or Not? : Be sure to decide whether or not you want a contour memory foam pillow or one that is of a normal shape. Both of them are on the market so don’t just assume that you need to get a contoured one. Whichever one you choose will be determined by your personal preferences. Consider Other Products: Many memory foam products are designed to work in conjunction with others. If you want the full memory foam experience, then consider what other products you might want to purchase along with your memory foam pillow, such as a mattress topper. Read the Care Guide: When you purchase your pillow, be sure that there’s a care guide that comes with it, and read all the enclosed information. This will help you take the best care of the pillow to maintain its durability. Do Your Homework: Reading this buyer’s guide is a fantastic start to get you on your way to purchasing the perfect memory foam pillow, but be sure to learn even more before you buy. Because they can be a bit pricey, you’ll feel much more comfortable with your purchase when you know that you made the right decision, and you’re actively pursuing your sleeping goals. There are a number of benefits to owning and using a memory foam pillow, and they will most likely vary in importance for you. It’s best to know ahead of time exactly what benefits you hope to experience, and how specifically you’d like to improve your sleep. Greater Comfort: Memory foam pillows are designed to enhance your comfort at night. There’s nothing more annoying than tossing and turning at night, trying to find the sweet spot. A memory foam pillow is designed to help create the sweet spot for you all night long. Because the foam responds to the unique contours of your body, you’ll find that you always achieve the proper firmness and comfort level each and every night. Better Alignment: The memory foam pillow is also designed to place your spine in the proper alignment throughout the night, especially when used in conjunction with a memory foam mattress. Whether you sleep on your back or side, the pillow will get you at the right height. When your body is in proper alignment it allows your muscles to better relax. A Cooler Night: If you tend to overheat at night then memory foam is going to be your new best friend. There’s nothing that makes sleeping more uncomfortable than overheating, and memory foam is designed to create circulation of air to keep you at the ideal temperature all night long. Hypoallergenic: Because memory foam is a hypoallergenic material, you’re going to experience key benefits by owning this pillow. Certainly if you’re someone who deals with allergies, or you simply have an allergen phobia, owning a memory foam pillow will help you sleep more soundly. Durability: Memory foam pillows are built to last, and maintain their shape throughout the years. Any standard pillow loses its shape quite quickly, but you should be able to go for a number of years before ever needing to purchase another memory foam pillow. Purchasing a memory foam pillow is one of the smartest things that you can do to enhance your sleeping and overall health. There are so many different kinds of memory foam pillows out there, and the technology is advancing on a consistent basis. It can seem daunting when you don’t know anything about memory foam, but with a little research, you can understand this amazing technology and how it can help you to achieve a better night’s sleep. Reading the above buyer’s guide and about the top rated foam pillows is a great start for your search, but be sure to do even more research so you fully understand what you’re purchasing. Searching online is an amazing way to read about the top brands and the latest technology when it comes to memory foam. The products that we reviewed above are considered to be the most trusted, offering durable pillows that help to enhance comfort and stand the test of time. There’s no doubt that one of these pillows will work for you, but if you would like something different then get online to search. If you think that it’s going to be important for you to feel the pillows to understand their density and softness, then go to your local home or bedding store for a more tactile experience. No matter which memory foam pillow you choose, you’re sure to experience better sleep than you ever imagined possible. Owning a memory foam pillow is an important step towards more restful nights and better alignment in the morning. 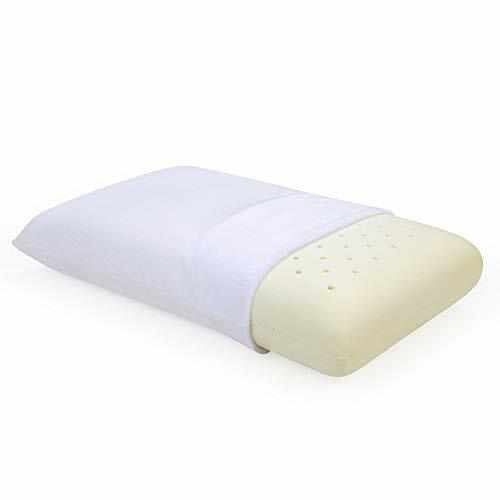 If you’re someone who suffers from sleep apnea, aches and pains in your shoulders or neck, or you tend to overheat at night, then owning a memory foam pillow is an amazing way to enhance your comfort and overall wellbeing.